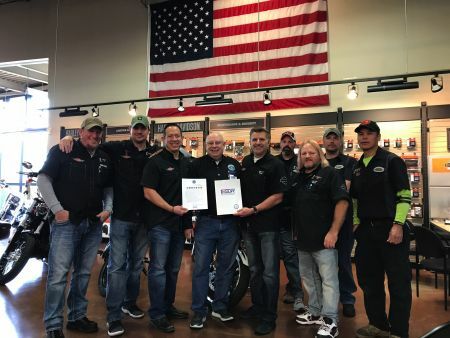 Northwest Harley-Davidson® has a long and deep connection with our Military. Our goal is to serve the men & women of our armed forces the best we can and especially those who have made the ultimate commitment to our country in writing a blank check made payable to the United States of America for an amount of up to and including their life. That is an honor, and there are way too many people out there who no longer understand it! Northwest Harley-Davidson® Military Sales Program was created with the vision for the program to give back to those who have given so much. WHAT IS THE MILITARY SALES PROGRAM? The program is Northwest Harley-Davidson®’s way of making sure you get the best service in purchasing your new or used Harley-Davidson® here stateside. You no longer have to wait to be deployed, meet with an off-site sales counselor like some current programs, then have to wait months to pick up your motorcycle when you return home. With NW H-D's® Military Sales, you will be treated better and see more value than those other overseas programs, and you'll actually get to touch and feel the motorcycle you deserve. Double Loyalty reward points on all qualifying purchases. Lifetime Powertrain Warranty (Travels with you! Click Here to learn more). The intent of the program is geared specifically towards getting military members a Harley-Davidson® motorcycle in a much deserving VIP way. WHAT BIKES APPLY FOR THE MILITARY SALES PROGRAM? The Military Sales Program in regard to vehicle sales applies to all new and used in stock Harley-Davidson® motorcycles at our dealerships. Stop by with your Military ID to see the specifics of what this program can do for you. *Financing offer available only to Active United States Military personnel and only on pre-owned Harley-Davidson® motorcycles financed through Eaglemark Savings Bank and is subject to credit approval. Not all applicants will qualify. The APR and down payment may vary based on the applicant’s past credit performance and the term of the loan. The customer is responsible for applicable taxes, title, licensing fees, and any other fees or charges at the time of sale. APR is calculated according to the simple interest method. Not valid in conjunction with other offers. Other terms, conditions, and limitations may apply. Financing offer is subject to change or cancellation at any time See Northwest Harley-Davidson® for details. Active Military includes United States Army, Navy, Marine, Air Force, Coast Guard, National Guard, and Reserves.